It made intraday high at 1,279 and low at 1,277 levels. A sustained close above 1,279 will take the parity higher towards key resistances around 1,289, 1,294, 1,307, 1,315 and 1,327 marks respectively. On the other side, a daily close below 1,279 will drag the parity down towards key supports around 1,272, 1,265, 1,257, 1,246 and 1,234 marks respectively. Seoul shares open down 0.07 pct. Korea, South Mar 2019 consumer sentiment index increase to 99.8 balance vs previous 99.5 balance. 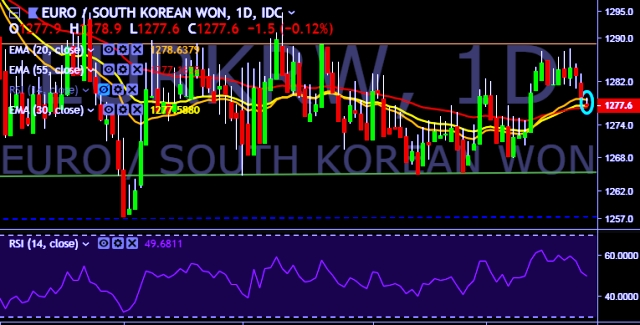 We prefer to take short position on EUR/KRW around 1,280, stop loss 1,289 and target of 1,272/1,265.